Now we’ve come to 13 Hours: The Secret Soldiers of Benghazi, a film which by its very nature allows Bay to canonize his precious soldiery and blaspheme the very government they represent. 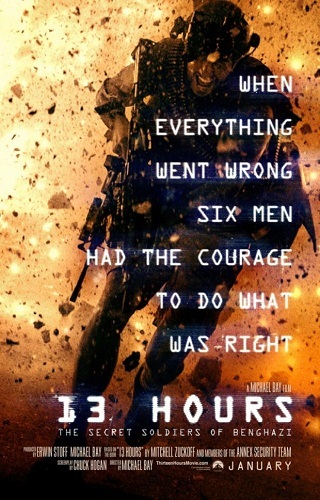 13 Hours isn’t so much a recreation of the September 11, 2012 Benghazi attack as it is a paean trumpeting the superiority of the American serviceman. In doing so, he creates a Tea Party polemic; a vivid realization of every ethnic and racial stereotype fostered against Middle Easterners filtered through a lens of American Exceptionalism. In trying to make his Black Hawk Down, Michael Bay has inadvertently made his own The Green Berets—as envisioned by Donald Trump. Never before have his protagonists been as scruffy-faced, monosyllabically-named (“Rone,” “Jack,” “Oz,” “Tig,” “Boon”), and interchangeable. Through the majority of the film I couldn’t tell any of the soldiers apart from each other, the sole exception being John Krasinski (“Jack”) who somehow managed to maintain a babyface beneath his rugged beard. That’s not a slam against Krasinski, per se: given the meager material he’s given to work with he manages to deliver the one emotionally impacting performance in the whole film. All this I could suffer if 13 Hours demonstrated even a modicum of technical acumen. I have always been willing to overlook politics I find personally repugnant—from the Stalinist hymns of the Soviet montage theorists to the quasi-fascism of John Milius—if the films themselves were artistically triumphant. Innocent civilians may have never been gunned down en masse by czarist soldiers on the Odessa Steps during the 1905 Potemkin Mutiny, but until the day I die I will praise the Odessa Steps sequence in Sergei Eisenstein’s Battleship Potemkin (1925) as one of the finest in the history of the cinema. But 13 Hours demonstrates a new low in Bay’s ability to command cinematic grammar. Despite being a military movie focusing on a number of urban battles, Bay stubbornly captures the vast majority of the chaotic fighting in medium, medium-close, and close-up shots which obfuscate and clutter the action. The editing is so fast and slapdash that it makes one long for the Jarmusch-ian languidness of Armageddon. In his eagerness to express the kineticism of warfare, Bay creates a film totally disconnected from all concepts of spatial and temporal orientation. Consider one pivotal sequence about halfway through the film. The heroic CIA security contractors disobey a direct (and entirely fictional) stand-down order to travel from their base to the beleaguered American diplomatic compound barely a mile away. Their job is simple: drive to the compound, retrieve the ambassador and his staff, and drive back to the base. But the entire sequence—which must have lasted 20-30 minutes—is a disjointed miasma of micro-second length shots, screaming and explosions. At no point could I distinguish where any of the characters were in relation to the CIA base, the diplomatic compound, or each other. All I knew was that at any given moment American troops were either driving around the streets of Libya, shooting at hordes of faceless Arabs, or gawking at civilian bystanders—frequently all three at the same time. The only battle sequences that work take place in the third act where the American soldiers, having returned to the CIA base with the compound survivors, barricade themselves and repel wave after wave of enemy combatants. These scenes marginally succeed because they force Bay to reduce his camera acrobatics and focus on firefights between two clearly delineated lines of fire. But even then Bay does his damnedest to confuse things with his kitchen blender style of editing. And did anyone else catch the multiple split-second first-person perspective shots mimicking first-person shooter video games? Even for Michael Bay that seemed pretty on-the-nose.